Greener glass has a particular resonance for me. The first piece I bought in my collection was this amber basket with a Japanese influence and an abstract design. It was finding out what I had bought that took me into the world of English pressed glass. The Wear Flint Glassworks in Sunderland traded under various names, changing from Angus & Greener to Henry Greener and lastly to Greener & Co in 1885. Greeener glass competed with several firms in the North-East, including Sowerby Glass and Davidson Glass. Henry Greener was apprenticed to a glassmaker and progressed to be a travelling salesman. He seems to have been a man of some business ability, a raconteur and wit so he was very likely good company. Early on the Greener glass firm registered some of their designs, starting in 1858. In 1869 they registered the well known political design “Gladstone for the Million” and they were known for making commemorative designs. In the 1870s the firm increased their range of articles produced and branched out into coloured glass items including malachite. 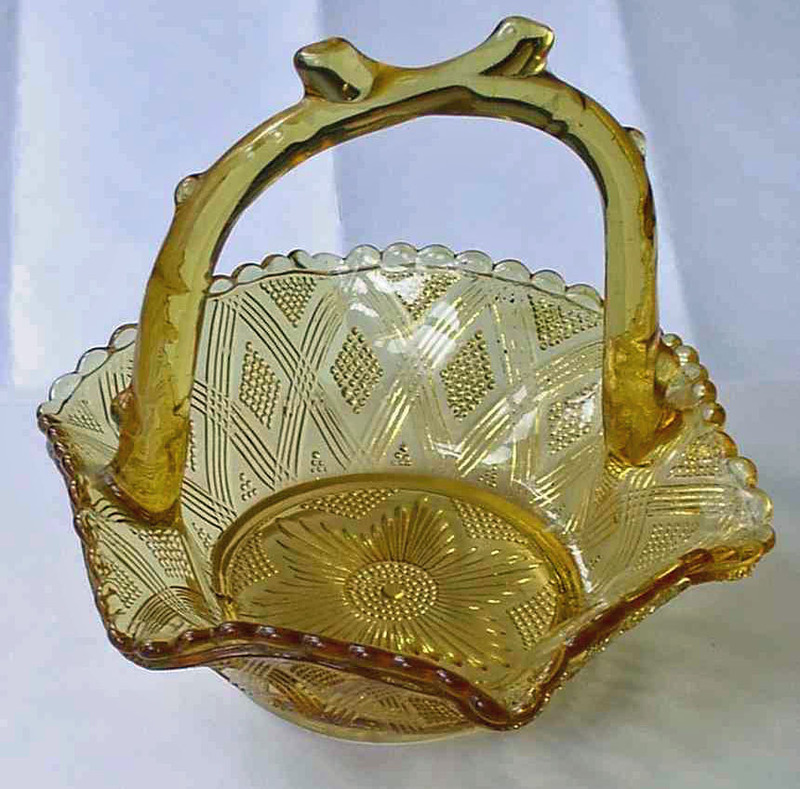 In the late 1880s they produced an interesting range of pressed glass baskets with a Japanese influenced design. James Jobling took over the firm in 1885 when it was not doing well and turned the company round. Six hundred different articles of domestic glassware were on their list along with commercial glass for trams, railways, ships and lighthouses. The firm remained one of the smaller ones however until after the first world war when they introduced Pyrex (under licence from the US) which was very successful. They produced a range of pieces for Queen Victoria’s Jubilee, by which time a large number of different designs and items were part of normal production.